Waiouru: Doug’s back and we’re stuffed! Doug returned today and completed the grit blasting. 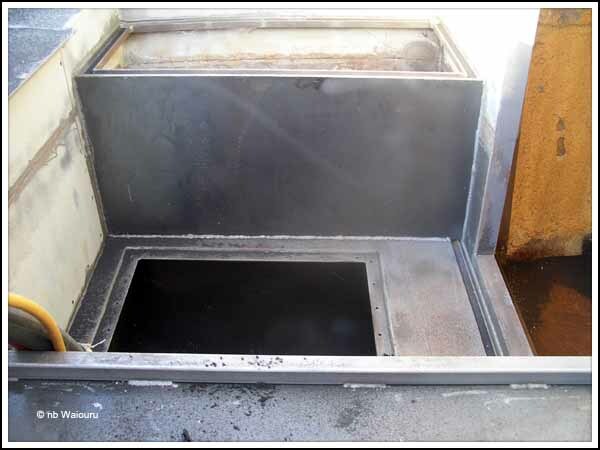 The area below the gunwale needed to be cleaned back to bare metal along with the cratch area and cockpit. 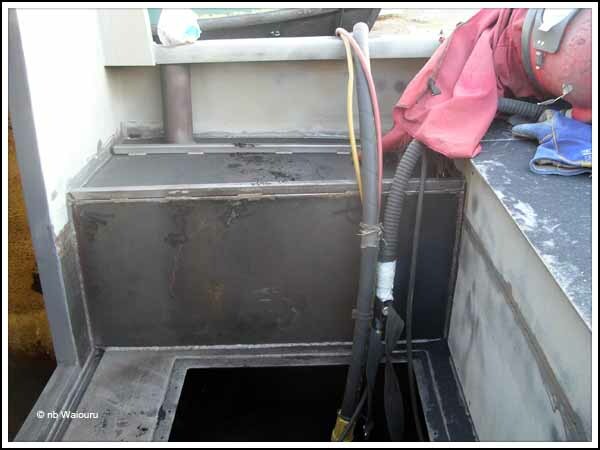 I also requested he clean the inside of the water tank under the foredeck and the engine hole. He managed to do all this by 12.30 leaving the “domestic goddess” and me with the painting. The grit blasting does a very good job of removing the old paint and rust. However it leaves black grit everywhere! The stuff is inert but it still has to be removed before any painting can commence. My strategy was to sweep up the larger areas and then use the boatyard wet/dry industrial vacuum cleaner for the remainder. 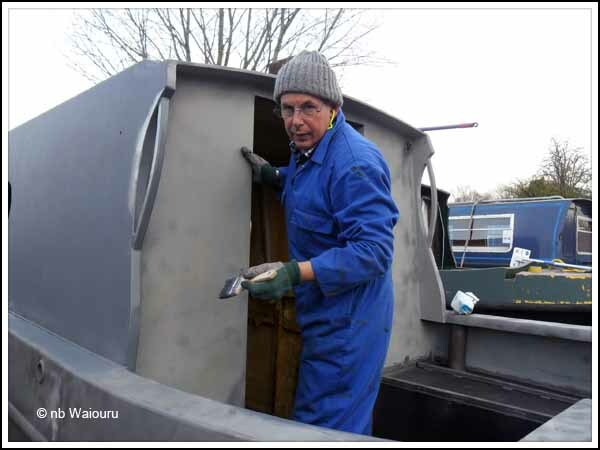 It was possible to start priming the cratch whilst Doug grit blasted the stern end of Waiouru. Another pair of hands is always useful and this elderly gent spent the afternoon with me. He has a pair of overalls the same colour as mine and even the same coloured knitted beanie. Actually, if it wasn’t for the fact he looks so old I’d swear it was me! 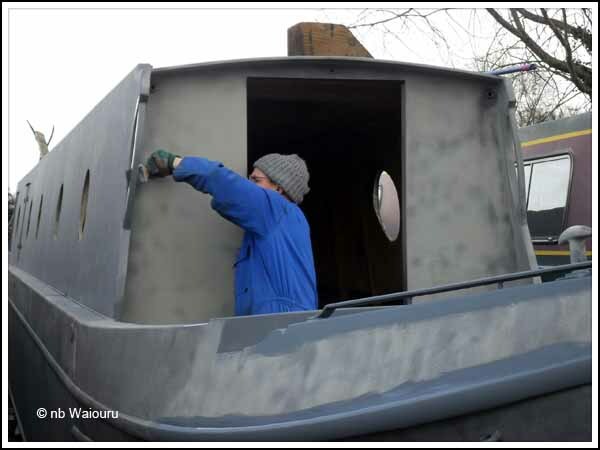 There are no further photo’s of the priming and first coat of two pack blacking onto the boat as we were both totally committed. On reflection; I didn’t stop from 9.00AM to 5:00PM. Jan offered to make me a sandwich for lunch but I just “boxed on”. We managed to get all the exterior bare steel either primed or blacked. Actually I think we’re both stuffed!! Tomorrow I’ll primer the remainder of the cratch and the engine hole. I’m going to leave the two pack blacking for at least one day to give it a chance to harden (and my muscles a chance to soften). Jan didn’t wear a hat and now has grey, black and brown speckled hair. "Jan didn’t wear a hat and now has grey, black and brown speckled hair." But she wants pink and purple hair! Oh... wonder what that colour scheme will look like?